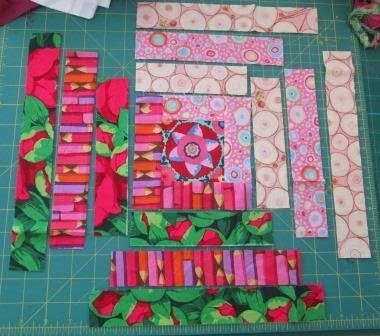 I signed up for a block exchange using Kaffe Fassett fabric collections. I love the fabric and have a pretty good collection these days. I am in Group 3 and I am the first to go. 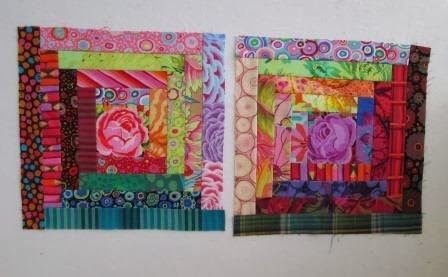 Here are my first two blocks. They are 11 1/2" log cabin blocks (finish to 11") . We exchange 2 blocks each month for 9 months. 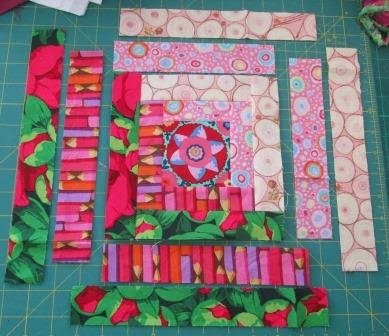 I made the first two blocks very scrappy and did not repeat many of the fabrics. I know some members in the exchange may not have so many fabric, so I thought I better show how to use less fabric verity. 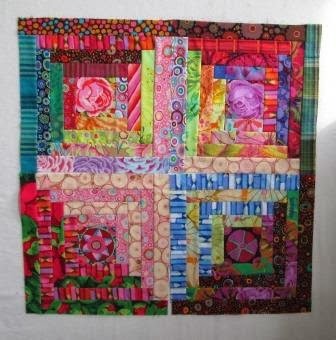 The block below uses 5 fabrics, 2 light and 2 dark and a fussy cut center. 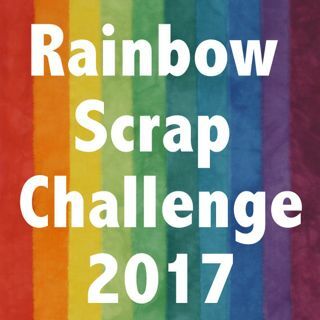 You can go scrappy or just use 5 fabrics. Please keep light fabrics and dark fabrics on the same side. 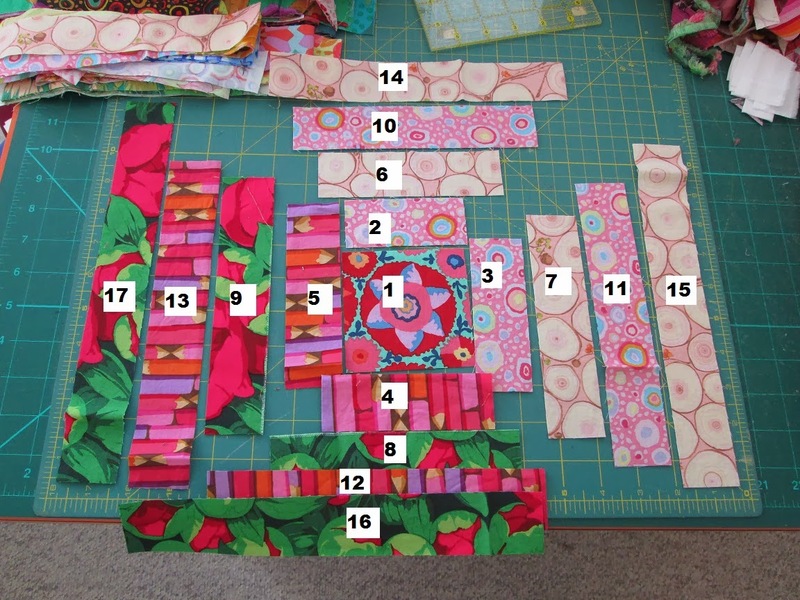 I cut all my fabric pieces and and started in the center. I added each piece and ironed before adding the next piece. This Photo has numbers and work with my cutting instructions. The logs are all cut from 1 1/2" strips of fabric. If you use 5 fabrics like this one , I just cut a 1 1/2" strip from selvage to selvage or two strips from a Fat Quarter. 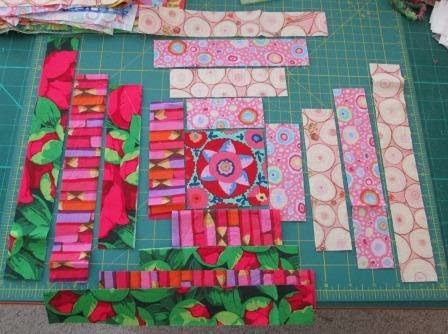 I love scrappy so if you have odd pieces you can cut less from each fabric. 2 - 1 1/2" x 3 1/2"
3 - 1 1/2" x 4 1/2"
6 - 1 1/2" x 5 1/2"
7 - 1 1/2" x 6 1/2"
10 - 1 1/2" x 7 1/2"
11 -1 1/2" x 8 1/2"
14 - 1 1/2" x 9 1/2"
15 - 1 1/2" x 10 1/2"
4 - 1 1/2" x 4 1/2"
5 - 1 1/2" x 5 1/2"
8 - 1 1/2" x 6 1/2"
9 -1 1/2" x 7 1/2"
12 - 1 1/2" x 8 1/2"
13 -1 1/2" x 9 1/2"
16 -1 1/2" x 10 1/2"
17 - 1 1/2" x 11 1/2"
First row all the way around. The block should measure 5 1/2" square. Second set of logs all the way around. The block should measure 7 1/2" square. Third row of logs all the way around. The block should measure 9 1/2" square at this stage. 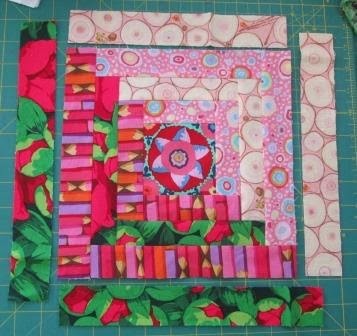 Finished block. The block should measure 11 1/2" square. Please do not trim down I can do this if needed. 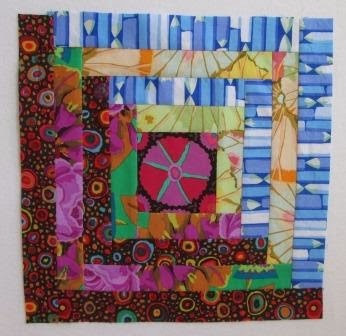 Another block using 5 fabrics. 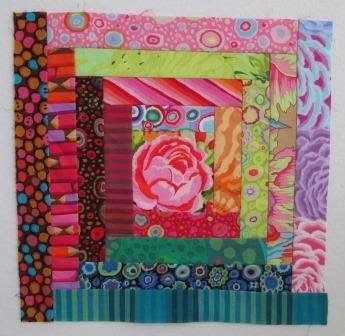 I love the stripe affect the pencil fabric gave this block. The first block I did you can see all the different fabric bits I used. I dug in my scraps to find the KF fabrics. 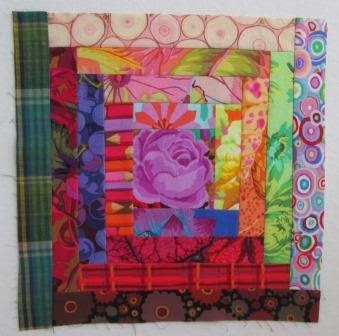 The second block I did, again you can see all the different fabrics. I love how the yellow gives it so much life. Yes I have more blocks done than I needed but I was having too much fun. I am thinking I may want 36 blocks in total. So I can make a few extras. Thanks you Group 3 ladies. I can not wait to see what I will receive. I am also looking forward to see what I will be making for each of you. Wow, love these. 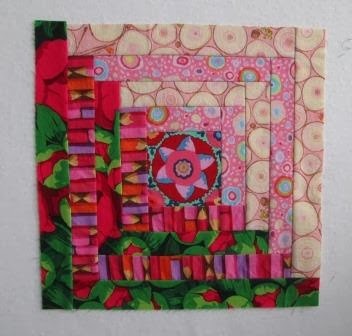 Of course I love Kaffe Fassett fabrics.